This 2 Bedroom moving kit contains all of the necessary moving boxes and packing supplies to make your house move as easy as possible! These multi-purpose boxes are ideal size and shape for packing most household items. Our industry quality boxes are heavy duty, double walled and weather/moisture resistant. 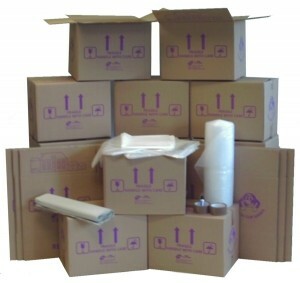 The boxes arrive flat packed, are easy to assemble, and can be disassembled and reused. The Medium cardboard moving box boxes, often referred to as a Tea Chest Box, are ideal for storing big, but light, items, such as kitchen utensils or lampshades. These large Boxes are most suitble to light goods, such as bedding, shoes, kids toys and etc. Use our large rolls of bubble wrap to pack and protect your fragile items. Where possible, our packaging products are made from recyclable material or the material is obtained from a sustainable environment. The boxes we supply are glued rather than stapled which makes them 100% biodegradable!